Thirty-three students at the Harrison County ATC just completed their OSHA Training. Twenty-two earned the OSHA 10-hour for Construction and 11 earned the OSHA 30-hour for Construction. The same 11 also earned their First Aid Certification. This was taught as part of the Construction Class at the Harrison County Area Technology Center. A donation from the Central KY Antique Machinery Association paid for the cost of the cards for the students. Students were from Harrison, Nicholas and Bourbon counties. 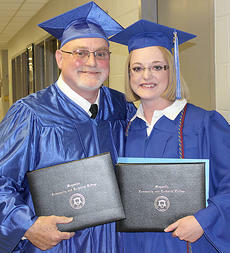 Last month, hundreds of students graduated from Maysville Community and Technical College. Among the sea of faces was a father–daughter duo, Scott and Autumn Gray. As his daughter Autumn prepared to begin college, she encouraged her father to go back as well. He was nervous and unsure about being surrounded by young students, but personnel at MCTC encouraged Scott to get started. “I remember them telling me, ‘I’m going to let you know right now that you are going to bring something to the table also.’” Scott said. John Biggs, Morgan Bihl, Preston Cole, Ava Denniston, Branson Fain, Blake Green, Shelbey Huber, Rylee Hudgins, Alana Romero-Lozano, Grayson Nickels, Owen Northcutt, Neil Olmsted, *Barrett Philpot, Dray Roberts, LeLand Rowell, Jacob H. Scott, Savannah Silcox, *Sarah Stump, Marie Thaxton. 4-H youth from across Kentucky will have countless opportunities to learn valuable life skills this summer, thanks to more than $825,000 donated by Tractor Supply Company customers earlier this year. Between April 26 and May 7, Cynthiana-area Tractor Supply stores hosted a Paper Clover fundraiser to help send thousands of 4-H youth to county-level development programs, camps and leadership conferences. Awarded as scholarships, the money will enable individual 4-H members to learn everything from science and technology to fishing and horseback riding. Hayden Lunsford, Camille Marshall, Morgan Morris, *Isabella Persinger, Garrett Price, Addison Roe, Haylie Sparks, Kira Spaulding, *Meredith Vaughn, Peyton Wagoner, Peyton Wilson, Briley Winkle. 1st Grade: Naomi Farrar-Laws, Mae Heimlich, Colton Jones. 2nd Grade: Annie Aldridge, Jack Perrin. 3rd Grade: Millie Hatfield, Madison Jones, Addison Perraut, Sarra Skinner, Kate Gasser. 4th Grade: Isaac Furnish, Grace Lang, Jackson Ware. 5th Grade: Skylar Hatfield, Abigail Rion. Camden Bowlin, Madison Delong, Hadley Hein, Debbi Webb. Lesley May, Colton McQueen, Justus Miller, Dane Ransom, John Sowder, Haylie Thornsburg, Tyler Tichenor, Bailey Vendler, Emma Waddelow, Colton Webber, Aubrie Winters. Kentucky Education and Workforce Development Sec. Hal Heiner has announced details about the new Work Ready Kentucky Scholarship (WRKS), which provides free tuition for programs in five business sectors that are considered high wage, high demand.